This casserole was a big hit this morning with our bed and breakfast guests. 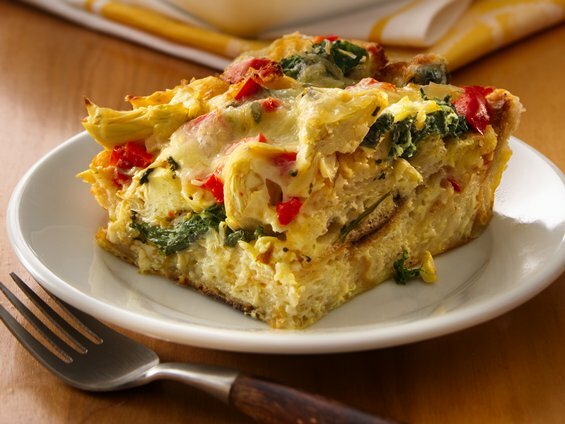 A Strata is a bread casserole, like bread pudding but lighter, which is usually savory and includes cheese and veggies. Whisk the eggs; add milk, dry mustard and salt. Set aside. In another large bowl place bread cubes and pour egg mixture over and gently mix to blend and let soak, mixing occasionally. Do this for 5 or 10 minutes until mixture has absorbed the egg/milk custard. Layer one half of the bread mixture in a 9 x 13 baking dish which has been sprayed with PAM. Then layer the chopped artichokes, lemon zest and thyme over that. Add one cup of the cheese over the artichokes and lemon zest. Then finish with another layer of the rest of the soaked bread cubes. Top with the second cup of cheese. Cover with tin foil which has been sprayed with PAM so it won’t stick to the cheese on top.